E M O C WEL Flowers are one of the three traditional offerings to the Buddha. As Spring blooms into Summer, the courtyard at the London Buddhist Centre is rich with offerings. But flowers are not just a thing of beauty; they’re a reminder of change. Buddhist practice helps us to engage with things as they really are. The fact of change can be uncomfortable but it needn’t be cause for despair – it’s a reality that also empowers us to change ourselves, our experience and the world around us. It might just be the source of our greatest joy. As well as writing on this theme from some familiar faces around the centre, we’ve featured some sayings of the Buddha from the chapter of the Dhammapada titled ‘Flowers’. We’ve also filled the following pages with photographs of the LBC and its retreat centre, Vajrasana, in bloom. From page 19, our programme of events lays out the rest of the LBC’s offerings from May to August. Devamitra tells his story of a life lived in pursuit of beauty and truth and the role that films have played in guiding him in the right direction. In late 1966 I was living in a dreary bedsit in West Hampstead. Skint, stage-struck and eighteen, I was excessively lonely – especially on Sunday evenings when theatres were dark. Walking up to Hampstead one day, I noticed the Everyman, a dowdy little cinema showing foreign films. I liked the atmosphere; there were no ads or trailers, and there was a new film every week. It was my salvation. I worshipped there religiously with its small, select congregation most Sunday evenings – initially because it was inexpensive, but quickly because I loved the films, which were a revelation to me. I never knew what to expect, but trusted their selection. The best of world cinema showed me that film could be much more than what I knew from Hollywood. The young hero’s questioning eyes, as he looks back in the final shot of Jansco’s My Way Home, reflected my own deeper thoughts, rousing them from their slumber. Over fifty years later that glance is still vividly alive in my imagination. When directors seek to empathise with all the characters they create – good or bad – then we too can enter their lives and broaden our human sensibilities. Devamitra teaches on Monday and Wednesday evenings at the LBC (see p.20). He also hosts a regular ‘Film Night’ at the LBC, showing a range of films that he’s particularly enjoyed (see p.27, p.30, p.33 and p.36). MORE TO LIVING THAN LIFE by Subhadramati Subhadramati draws upon anecdotes from her own life to reflect on death, our relationships to others and the central problem that we face in trying to live meaningfully. A few weeks ago, the community of women I live with spent a Saturday afternoon sitting in our living room with home-made vegan chocolate cake and mugs of Rooibos tea, talking about death. The eldest of our number started by sharing her first experience of death, that of her grandmother. What stayed in her mind all these years was the vicar’s saccharine eulogy which did no justice to her grandmother’s colourful character. Everyone chipped in with funeral experiences of their own: Irish Catholic, Lithuanian Catholic, Italian Catholic, Caribbean; some of us had been to Triratna Buddhist funerals too. We debated what the ingredients of a satisfactory funeral were and what kind of funeral we wanted for ourselves. Then, warmed up to our theme, we moved onto death itself. Some recalled sudden deaths or near-deaths of relatives – the details fresh as if they’d happened only days before. lives and find a way to commit ourselves to it, we won’t fulfil our deepest human potential. Death puts things in their proper place. Things that bothered us before are suddenly irrelevant. I had a friend who always used to talk in the silent periods on retreat. She even used to pass remarks in the shrine room when we were about to meditate. It drove me crazy! Then she suddenly died. I remember the first Order weekend without her. I found myself wishing, ‘Oh, if only you could come back, you could talk as loudly as you like and I wouldn’t mind!’ The tragedy, of course, is that we often learn too late. A truly wise person wouldn’t wait until their friend – or even their enemy – was dead to have this realisation. attending to this issue of how to stop our life, no matter how ‘good’ we are, simply circling around ‘me-at-the-centre-of-everything’. Buddhism is clear that this isn’t a moral issue (we’re not to blame for it), but an existential one. At the same time, if we don’t do something about it, it’s a knot that will only get tighter and, crucially, will stop us fulfilling our deepest potential. Rather on focus on why the universe is as it is, the crucial issue became how I should live my life as a part of it. Subhadramati teaches on Monday and Wednesday evenings at the LBC (see p.20). From Weds 10th July, she’ll be co-leading ‘How to live: What to do’, a six-week course based on her book ‘Not About Being Good: A Guide to Buddhist Ethics’ (see p.31). love asks us to do something, we can find ourselves not just doing it but delightedly doing it. We want to make them happy. In fact, their happiness is our happiness. So who’s will is being carried out here? It’s not wholly true to say it’s our will, because we’ve been asked to do the thing by our loved one. But it’s not wholly their will either because we have (willingly) carried out the action. It’s a blending of wills. If we practice expanding this process to include more and more people, then we’ll be loosening the knot of ‘me-at-the-centre-of-everything’; we’ll be breaking out of that closed circle of self-interest. Instead of surrendering our will, we can think of times when our will has blended with the will of another’s. ood As a great fl ya carries awa lage, so sleeping vil off the death bears s se s se d o ne w ho, p o plucks of longing, wers of only the flo existence. t wasn’t Amaladana ination retrea d or e th d, or what In the en ed to attain ag an m I e t ha about w – it was mor ations I had it ed m l u e. rf pl wonde ith other peo could live w have ’t n id about how I d d ildren an ch h it w y ed ri I’m mar a communit ce of living in n ie er p en ex much t by the d ary at first, bu w as w I t. ne. It was contex wards everyo to m ar w ry I felt ve it wasn’t all ce because n ie as er p ex a rich at times it w and lovely – d ar rw ry fo sa ht straig ething neces there’s som difficult and about that. Practising the Dharma has shown me that what I can’t yet imagine can be far better than anything I can. Sarah I’ve not been on a retreat for longer than two weeks before. This is an extra ten! The whole thing has got this mysterious potential to it that I feel really drawn to. It’s like something right in the depths of my being knows that this is the best thing I could do with my life. I see joining the Order as taking part in a force for goodness in the world. There’s a little bit of fear – I feel like I’m in a process of letting go of who I currently am – but I’m excited to move into something new. The whole thing has got this mysterious potential to it that I feel really drawn to. Todd I’ve always liked my name, so I’m not looking forward to waving it goodbye. But however I feel about the new name when I hear it for the first time, I know that it will symbolise something that I want more than anything else, which is transformation. I know I need to transform my life. I think transformation is bigger than personal development or growth. It’s something you can’t imagine. Practising the Dharma has shown me that what I can’t yet imagine can be far better than anything I can. MONDAY TO SATURDAY LUNCHTIME MEDITATION TASTER Drop in and learn some of the principles of meditation or join the regulars to take your practice deeper. 1pm – 2pm. By donation. WEDNESDAY MORNING DAYTIME DHARMA & MEDITATION CLASS A friendly and diverse class offering teaching and inspiration to newcomers and experienced practitioners alike. The first Wednesday of each month is a practice morning devoted to meditation and ritual, without meditation teaching for beginners. 10.35am – 12.30pm. Crèche facilities for children 6 mths – 5 yrs, supported by experienced staff. By donation. MONDAY EVENING DHARMA NIGHT Þ Explore Buddhism through seminars, talks, meditation and puja. Whether you have done one of our introductory courses and want to learn more, or you have learned to meditate with us and are wondering what being a Buddhist means, drop in any Monday evening. 7.15pm – 9.45pm. Suggested donation £7. THURSDAY EVENING REGULARS YOGA CLASS A 90-minute class providing a chance to progress deeper into your yoga practice. Not suitable for beginners. Wear warm, comfortable clothing. 7pm – 8.30pm. £12. TUESDAY AND WEDNESDAY EVENING MEDITATION Meditation is a way of creating a fit and healthy mind and a positive and creative world. Drop in either to learn meditation from scratch or to take your practice further and cultivate clear awareness, peace of mind and emotional positivity. 7.15pm – 9.30pm. Suggested donation £11/£6. Let the silent sage move about in the village as the bee goes taking honey from the flower without harming colour or fragrance. WEEKDAY LUNCHTIME & EARLY EVENING YOGA Drop-in sessions of yoga for meditation, encouraging flexibility, strength and awareness of bodily sensations. Suitable for all levels. Weekday lunchtimes, 12pm – 12.45pm & 1.15pm – 2pm. By donation. Mon/Tue/Wed/Fri evenings, 5.45pm – 6.45pm. £8. Þ Suitable only if you’ve been taught the Metta Bhavana and Mindfulness of Breathing meditation practices. FRI 3 – MON 6 MAY p INTRODUCTION TO BUDDHISM & MEDITATION WEEKEND RETREAT An ideal way to encounter meditation and the Buddhist vision for the first time. Join us to learn two far-reaching meditation practices and live communally in the countryside for a long weekend. Led by Mahamani & Maitreyaraja. £225 (£178 concs). At Vajrasana. Book online. SAT 4 MAY SUB25 BREAKFAST SEMINAR Join Dhammadinna as she brings her wealth of experience in Buddhist teaching and practice to exploring the Kasibharadvaja Sutta. In this early text, the Buddha describes the skill and effort needed to lead a truly meaningful life. 10am – 12.30pm. Followed by café lunch. For those aged 16 – 25. Suggested donation £7. SUN 12 MAY PARENT DROP-IN DHARMA A class to give parents, non-parents and prospective parents the opportunity to practise together. 10.35am – 12.30pm. Second Sunday of the month. Crèche for children 6 mths – 5 yrs and activities for children 6 plus. Babies under 6 mths are welcome in the adult session. Suggested donation £7.  MORNING MEDITATION INTENSIVE: AN EVER INCREASING FREEDOM Þ Meditation is an art. We learn the basics, then spend a lifetime deepening our ability to work effectively with our minds. Come and learn how to deepen your experience of meditation over two drop-in intensive mornings. Led by Maitrivajri. 9.30am – 12.30pm. (Doors open at 9.15am). Suggested donation £15. 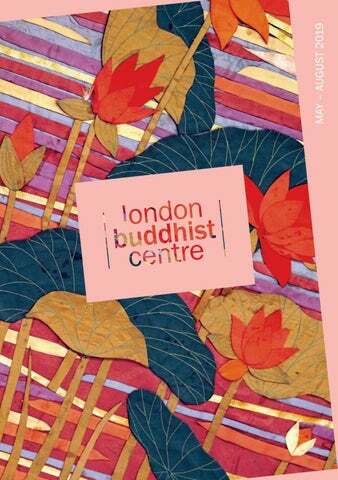 London Buddhist Centre | May – Aug 2019 SAT 18 MAY DISCUSSION MORNING FOR WOMEN WHO HAVE ASKED FOR ORDINATION Þ A wonderful opportunity to come together to discuss and reflect on your practice, meet up with old friends, make new ones and deepen your practice of going for refuge. With Subhadramati, on Spiritual Death and Rebirth. 10am – 12.30am. By donation. SAT 18 MAY FULL MOON PUJA In coming together for a short ritual on the full moon of each month, we are joining Buddhists across the world in a tradition that goes back to the Buddha himself. After lunchtime class. 2.30pm. By donation. FRI 17 MAY SUB25 CLASS: MASTERING FRIENDSHIP Meditation, Buddhism and discussion led by a group of young Buddhists, with an experienced teacher joining us each month. In May, Subhadramati explores how it was that the Buddha made friendship ‘the whole of the spiritual life’. 7.15pm – 9.45pm (Tea and cake ‘til 10.30pm). For those aged 16 – 25. Suggested donation £7. SAT 25 MAY TRANSFORMING SELF AND WORLD: EMPATHY IN ACTION Þ Join Shantigarbha who will share from his new book I’ll Meet You There: a practical guide to empathy, mindfulness and communication. With guided reflections, stories from the Buddha and practical exercises to help you develop your listening skills. 10am – 1pm. Last Saturday of the month. Suggested donation £7. SUN 19 MAY BUDDHA DAY Everything we now call ‘Buddhism’ started with the Buddha’s Enlightenment two-and-ahalf thousand years ago. A day to celebrate and explore that remarkable achievement through talks, reflection, meditation and ritual. Concluding with Mitra ceremonies. Led by Subhadramati & Amalayodhin. 10am – 10pm. See full programme nearer the time. Bring vegetarian lunch to share. By donation. SUN 26 MAY BUDDHIST SUNDAY SCHOOL Encouraging and developing our children’s mindfulness and kindness through Buddhist teaching, practice, storytelling and crafts. For 3 – 12 year olds. Parents/carers are welcome. Led by Jyotismati and team. 10.30am – 12.30pm. Last Sunday of every month. Suggested donation £7.  INTRODUCTION TO BUDDHISM & MEDITATION COURSE A six-week course led by experienced teachers offering an overview of Buddhist principles and an introduction to two meditation practices that cultivate selfawareness, open-heartedness and spiritual insight. Mon evenings, 7.15pm – 9.45pm. £110 (£90 concs). Book online. STARTS SAT 1 JUN THE MANDALA OF THE IMAGINATION Þ Find out how the imagination can lead us into deeper levels of being, understanding and insight. A course for Mitras to explore the imagination over three full days with meditation, reflection, talks and simple painting exercises. Led by Amitajyoti. Saturdays 1, 22 Jun & 13 Jul. 10am – 5pm. Bring vegetarian lunch to share. £140 (£120 concs). All materials included. Book online.  YOGA AND MEDITATION FOR BEGINNERS A four-week course suitable for beginners. Learn the principles of yoga and meditation in a small group with clear, comprehensive guidance and a supportive atmosphere. 7pm – 8.30pm £40 (£30 concs). Book online. SAT 1 JUN YOGA FOR MEDITATION WORKSHOP Yoga has been used for centuries as a preparation for meditation; in this workshop we’ll explore the relationship between the two. We’ll start with a dynamic yoga practice and end with a restorative session for balance and relaxation. Led by Danayutta. 3pm – 5.30pm. £25 (£20 concs). Book online. FRI 7 – SUN 16 JUN p MEN’S INTENSIVE MEDITATION RETREAT: ENTERING EMPTINESS * The first goal of Buddhist meditation is to cultivate a ‘fit mind’: taking ownership of our life and developing a courageous and creative outlook. On this retreat we will learn how to cultivate such a mind through Samadhi (energized calm) and how to use it to turn our attention to how things really are through Prajna (wisdom). With seven days of silence and one-to-one meditation reviews. Led by Jnanavaca & Satyadasa. £461 (£349 concs). At Vajrasana. Book online. SUN 2 JUN BUDDHISM & 12-STEP RECOVERY Þ A day for people interested in Buddhism and meditation who are also in 12-Step Recovery Groups. Led by Sanghasiha. 10am – 5pm. Bring vegetarian lunch to share. Suggested donation £30. SUN 9 JUN PARENT DROP-IN DHARMA A class to give parents, non-parents and prospective parents the opportunity to practise together. 10.35am – 12.30pm. Second Sunday of the month. Crèche for children 6 mths – 5 yrs and activities for children 6 plus. Babies under 6 mths are welcome in the adult session. Suggested donation £7. SAT 15 JUN FILM NIGHT That Obscure Object of Desire (1977). Buñuel’s final film is funny, unpredictable, engaging and disturbing. Two very different women alternate in the same role as the object of one man’s lust. Led by Devamitra. 7.15pm. Suggested donation £7. SAT 15 JUN THIRD SATURDAY WOMEN’S CLASS Þ A meditation and Buddhism class for women. Discuss the Dharma, deepen the mind, cultivate friendship. Led by Maitripuspa and Padmalila. 3pm – 5.30pm. Free. Suggested donation £7. SAT 15 JUN DISCUSSION MORNING FOR WOMEN WHO HAVE ASKED FOR ORDINATION Þ A wonderful opportunity to come together to discuss and reflect on your practice, meet up with old friends, make new ones and deepen your practice of going for refuge. With Sraddhagita, on Padmasambhava’s teaching to the three fortunate women. 10am – 12.30pm. By donation. JUNE (Contd.) SUN 16 JUN YOGA & MEDITATION DAY These immersive practice days are essential for boosting inspiration and maintaining a sense of creativity in yoga and meditation. Suitable for beginners and regulars. 10am – 5pm. £40 (£30 concs). Bring vegetarian lunch to share. Book online. FRI 21 – SUN 23 JUN p INTRODUCTION TO BUDDHISM & MEDITATION WEEKEND RETREAT An ideal way to encounter meditation and the Buddhist vision for the first time. Join us to learn two far-reaching meditation practices and live communally in the countryside for a weekend. Led by Prajnamanas & Garavavati. £195 (£154 concs). At Vajrasana. Book online. MON 17 JUN FULL MOON PUJA In coming together for a short ritual on the full moon of each month, we are joining Buddhists across the world in a tradition that goes back to the Buddha himself. After Dharma Night Class. 9.45pm. By donation. FRI 21 JUN SUB25 CLASS: CONQUERING HATRED Meditation, Buddhism and discussion led by a group of young Buddhists, with an experienced teacher joining us each month. In June, Padmavajra makes a special visit from Padmaloka to talk about the Buddha’s radical loving-kindness and the social revolution it started. 7.15pm – 9.45pm (Tea and cake ‘til 10.30pm). For those aged 16 – 25. Suggested donation £7. SUN 23 JUN OPEN DAY On these stimulating and lively days, you can get a sense of what goes on at the London Buddhist Centre. 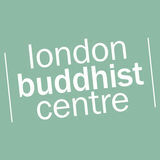 Find out about Buddhism, learn to meditate or try a taster session in Breathing Space. 11am – 5pm. See full programme nearer the time. All events free with refreshments provided. FRI 28 JUN – FRI 5 JUL p YOGA & MEDITATION RETREAT Come and join us for a week in the countryside, practicing yoga and meditation. Over the retreat we will be working to integrate our body and mind to create a positive and unified whole. Suitable for complete beginners as well as those familiar with meditation and yoga. £427 (£322 concs). At Vajrasana. Book online. SAT 13 JUL YOGA FOR MEDITATION WORKSHOP Yoga has been used for centuries as a preparation for meditation; in this workshop we’ll explore the relationship between the two. We’ll start with a dynamic yoga practice and end with a restorative session for balance and relaxation. Led by Garavavati. 3pm – 5.30pm. £25 (£20 concs). Book online. Get down to basics and learn meditation from the ground up with this four-week course. A chance for beginners to systematically discover the purpose and practice of meditation. You’ll be supported with handouts, home practice and simple, straightforward teaching. Led by Sanghasiha and Prajnadevi. 7.15pm – 9.45pm. £100/£80. Book Online. STARTS WED 10 JUL How do we make the most of life? Your everyday life might be wildly ecstatic, unbearably agonizing or just plain dull. Whatever your starting point, you can engage with a practical path to harmony and fulfilment, helping yourself and becoming a positive force in the world around you. A six-week course using Subhadramati’s book Not About Being Good: A Guide to Buddhist Ethics as our guide. Led by Subhadramati and Prajnamanas. Weds evenings, 7.15pm – 9.45pm. £110 (£90 concs). Price includes the book. SUN 14 JUL DHARMA DAY: KONDAÑÑA KNOWS The Buddha was overjoyed when his old friend Kondañña became the first person to truly understand the Dharma he was teaching. This spark of Truth has passed to the present day, from person to person, in friendship. Join us for a day of meditation and celebration of the precious gift of the Buddha’s Dharma. Concluding with Mitra ceremonies. Led by Satyadasa & Sraddhagita. 10am – 10pm. See full programme nearer the time. Bring vegetarian lunch to share. By donation. SAT 13 JUL MANTRA & MEDITATION MORNING Þ Mantras are sound symbols that point towards the mystery and beauty of Enlightenment. On this morning, through meditation and chanting, we will attempt to explore that mystery. Led by Dayabhadra. 9.30am – 12.30pm. Suggested donation £15. SUN 14 JUL PARENT DROP-IN DHARMA A class to give parents, non-parents and prospective parents the opportunity to practise together. 10.35am – 12.30pm. Second Sunday of the month. Crèche for children 6 mths – 5 yrs and activities for children 6 plus. Babies under 6 mths are welcome in the adult session. Suggested donation £7. JULY (Contd.) SAT 20 JUL DISCUSSION MORNING FOR WOMEN WHO HAVE ASKED FOR ORDINATION Þ A wonderful opportunity to come together to discuss and reflect on your practice, meet up with old friends, make new ones and deepen your practice of going for refuge. Theme and leader TBC closer to the time. 10am – 12.30pm. By donation. MON 15 JUL WELCOME BACK EVENING Ordination is a highly significant aspect of the Dharma life which has the potential to radically transform the lives of many. In this special celebratory and devotional evening will welcome back ex-Hanka and ex-Sarah who, all being well, will have recently returned from a long ordination retreat in Spain. Led by Suryagupta. 7.15 – 9.45pm. Suggested donation £7. SAT 20 JUL THIRD SATURDAY WOMEN’S CLASS Þ A meditation and Buddhism class for women. Discuss the Dharma, deepen the mind, cultivate friendship. Led by Mahamani & Padmalila. 3pm – 5.30pm. Free. Suggested donation £7. TUE 16 JUL FULL MOON PUJA In coming together for a short ritual on the full moon of each month, we are joining Buddhists across the world in a tradition that goes back to the Buddha himself. After Tuesday Night Class. 9.30pm. By donation.  INTRODUCTION TO MEDITATION DAY Spend a day discovering how to keep your mind and heart in focus. You’ll learn two meditation practices that cultivate openness, clarity and courage. 10am – 5pm. £40 (£30 concs). Bring vegetarian lunch to share. Book online. FRI 19 JUL SUB25 CLASS: MEETING GRIEF Meditation, Buddhism and discussion led by a group of young Buddhists, with an experienced teacher joining us each month. In July, LBC Chair Suryagupta explores the Buddha’s kind but uncompromising response to grief and loss. 7.15pm – 9.45pm (Tea and cake ‘til 10.30pm). For those aged 16 – 25. Suggested donation £7. SAT 27 JUL TRANSFORMING SELF AND WORLD Þ A morning exploring a Buddhist perspective on the social issues of the day. How can we apply the Dharma to transform ourselves and our communities? 10am – 1pm. Last Saturday of the month. Suggested donation £7. SAT 27 JUL FILM NIGHT The Fog of War (2003). Candid, moving and insightful, Robert McNamara, US Defence Secretary during the Cuban missile crisis and the Vietnam war reflects on lessons learnt from his long life. Led by Devamitra. 7.15pm. Suggested donation £7. SUN 28 JUL BUDDHIST SUNDAY SCHOOL Encouraging and developing our children’s mindfulness and kindness through Buddhist teaching, practice, storytelling and crafts. For 3 – 12 year olds. Parents/carers are welcome. Led by Jyotismati and team. 10.30am – 12.30pm. Last Sunday of every month. Suggested donation £7. FRI 9 – SUN 18 AUG p SUMMER RETREAT: THE DRAMA OF COSMIC ENLIGHTENMENT The greatest of all transformations is the growth and development of human consciousness. Personally we can change our mind and our day-to-day lives; universally we can enter into a cosmic drama that will illuminate our imaginations and resonate at the deepest core of our being. Come on this retreat and discover the personal and universal significance of the Buddha’s Enlightenment. Aimed at those who are new to meditation and Buddhism. Led by Suryagupta & Vidyadaka. £461 (£349 concs). At Vajrasana. Book Online. THU 15 AUG FULL MOON PUJA In coming together for a short ritual on the full moon of each month, we are joining Buddhists across the world in a tradition that goes back to the Buddha himself. After Thurs Night Yoga Class. 8.45pm. By donation.  CHI-KUNG WORKSHOP Learn some warm-ups and standing postures of Chi-Kung, then bring the energy generated into meditation. For health, inner strength and tranquility. Suitable for all levels. Led by Jayaka. 10.00am – 12.30pm. £15. Book online. FRI 16 AUG SUB25 CLASS: LEAVING HOME Meditation, Buddhism and discussion led by a group of young Buddhists, with an experienced teacher joining us each month. In August, Amalayodhin discusses comingof-age stories and the Buddha-to-be’s first big step on his spiritual quest. 7.15pm – 9.45pm (Tea and cake ‘til 10.30pm). For those aged 16 – 25. Suggested donation £7. SAT 17 AUG THIRD SATURDAY WOMEN’S CLASS Þ A meditation and Buddhism class for women. Discuss the Dharma, deepen the mind, cultivate friendship. Led by Maitripuspa and Padmalila. 3pm – 5.30pm. Free. Suggested donation £7. FRI 16 – SUN 18 AUG p NATIONAL SUB25 RETREAT Travel with a group of us from London to the beautiful Herefordshire countryside where we’ll join others from across the country on this big annual retreat. A chance to deepen our engagement with our minds, our lives and the world, through meditation, discussion, friendship and ritual. At Adhisthana in Herefordshire. £74/£52. For those aged 16 – 25. Book online. AUGUST (Contd.) SUN 18 AUG YOGA & MEDITATION DAY These immersive practice days are essential for boosting inspiration and maintaining a sense of creativity in yoga and meditation. Suitable for beginners and regulars. 10am – 5pm. £40 (£30 concs). Bring vegetarian lunch to share. Book online. MON 26 AUG 108-YEAR PUJA FOR BHANTE Bhante Sangharakshita, who died last year, was the founder of the Triratna Buddhist Community whose members are pioneering a ‘living Buddhism’ which can lead to the radical transformation of ourselves and the creation of a new society. Each year, on his birthday, we celebrate his life and work with a special puja. This is the seventeenth year of the 108 years that the puja will be taking place. All are welcome! 7.15pm. Part of Dharma Night. Suggested donation £7. SAT 24 AUG FILM NIGHT This Must Be the Place (2012), Sorrentino’s first film in English is characteristically quirky, humorous and beautifully shot, its resolution as extraordinary as Sean Penn’s performance as an ex-rock star. Led by Devamitra. 7.15pm. Suggested donation £7. The Transforming Self & World Class, Parent Drop-In Dharma and the Buddhist Sunday School will all take a break in August. Join them as usual from September. SUB25 SATURDAY MORNING BREAKFAST SEMINARS 4 MAY: Kasibharadvaja Sutta with Dhammadinna 6 JUL: The Heart Sutra with Jnanavaca 10am – 12.30pm. Followed by café lunch. Suggested donation £7. NATIONAL SUB25 RETREAT FRI 16 – SUN 18 AUG £74 (£52 concs) At Adhisthana in Herefordshire. Book online. Turn to the monthly listing pages to find out more about the events on this page. To join the mailing list or to ask any questions, you can contact the Sub25 team on Sub25@lbc.org.uk. Our latest magazine and programme of events.